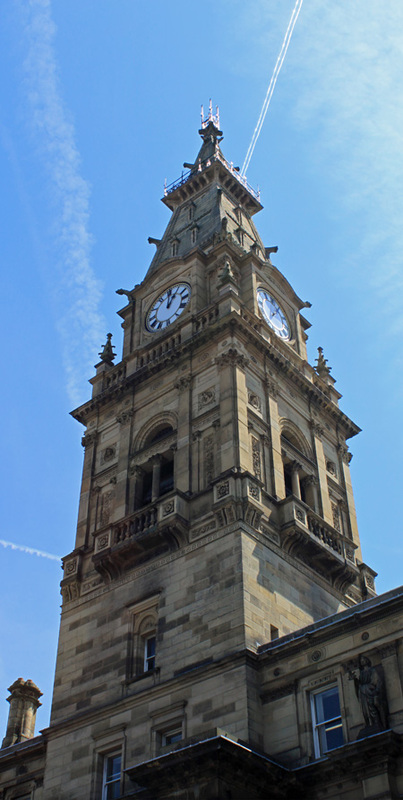 The tower on the Municipal Buildings, Dale Street, Liverpool. Another photograph taken on one of my lunchtime wanderings round Liverpool with my camera. This one is of the tower on the Municipal Buildings, Dale Street. The building was begun in 1860 by John Weightman and completed in 1866 by E.R. Robson. It’s Italian and French Renaissance influenced Northern Renaissance style are quite a contrast to the art deco structures of the Mersey Road Tunnel I posted last week. The central tower with balconies, clocks and five bells has a pyramidal spire. The spire has a wrought-iron balcony half-way down.